I have a death record from 1872 in England and all that is written is name, cause of death, where, and a witness. There is no information as to who the parents were. This is not a huge issue as I know who they were anyhow but would have like to have more data on them such as whether they were still alive as I am struggling to find out this info. Is this typical of records for this time period in England not to have information of parents? I have seen one in Scotland from 1857 for a different person that has information on parentage. The situation in Scotland is different, and information about the parents of the deceased is included (provided that it was known to the informant). 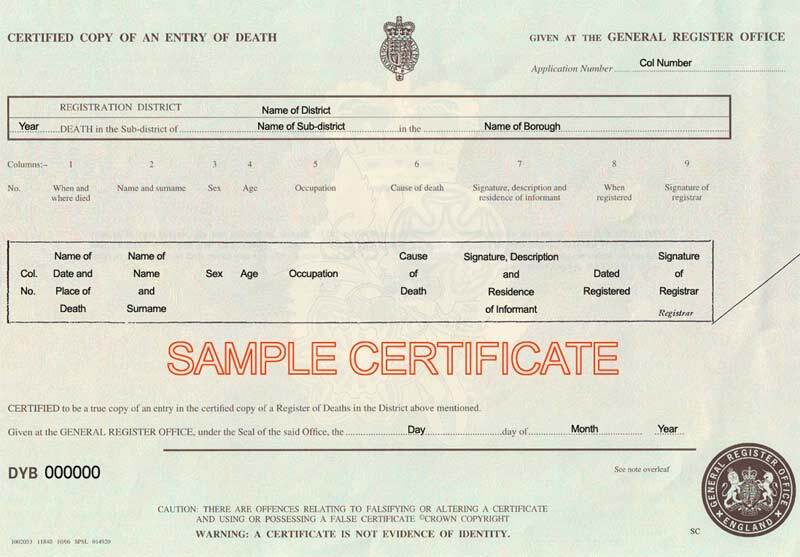 As @sempaiscuba's answer states, parentage information was not normally included on death certificates in England and Wales. There are, though, at least a couple of situations where one or both parents might be identified. The GRO has some handy little guides to the information shown on standard Birth, Marriage and Death certificates here. This will be the last known occupation of the deceased. Females were usually recorded by their relationship to husband or father - e.g. 'widow of'. You may also find that the Informant has a described relationship to the deceased (mother, daughter, widower etc). This is not always the case, but the GRO notes that such relationships were recorded as standard after 1875. In the example above from 1858, Ann Hill is almost certainly Emily's mother, but is not described as such. Not the answer you're looking for? Browse other questions tagged england death-records parentage or ask your own question.